This one is going to be really easy and will save you tons of money on specially discounted drugs from our wholesalers. First, login to your pharmacy account at PharmSaver.net. You'll see your custom home page with order history and on the right side of the page, the Activity Center. Check out Deal of the Day (DOTD) section. This is a list that scrolls and flips its way through all DOTD offers from all wholesalers. 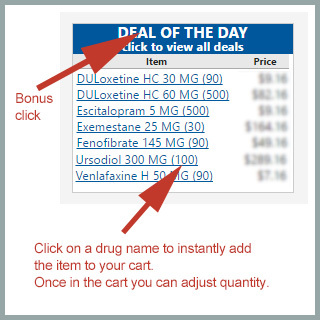 Clicking on a drug name adds that item to your cart. Tired of watching the deals scroll by? Click on the heading "DEAL OF THE DAY" and you'll be treated to a list of all deals showing the item, NDC, price and wholesaler. If an item is short dated (less than 270 days), the item appears in red. Click on the drug name to add to your cart. It's that easy to save every day.